Are you ready to fall in love with something new? A simple practice, perhaps, that relaxes your body, clears your mind and leaves your spirit balanced and buoyant? A gentle exploration that doesn't require you to change your clothes, buy new equipment or even roll out your yoga mat? If so, have I got a practice for you! Qigong (pronounced chee gung) is a centuries-old movement and meditation practice designed to promote physical, mental and spiritual health. Through flowing movements, gentle breathing practices and mindful intention, this ancient Chinese art helps relieve the body of toxic stress while opening us to renewed streams of healing energy. Qigong is a close cousin of traditional yoga, even though the practices were born in different countries and of different philosophies. Like yoga, qigong uses the body and the breath to promote a greater sense of being at home in the world, and also harnesses the power of the mind to promote clarity and light. And like yoga, it aims to cultivate vital energy within us - called prana in yoga and chi in qigong. The similarities are so great that qigong is sometimes even called "Taoist yoga." But qigong relies on traditional Chinese medicine to explain and explore the body, mind and spirit, rather than yoga's Indian vision. Its movements are generally more round, fluid and gentle than those in yoga, and they are always secondary to the mind, the breath, and a profound experience of internal energy flowing through us all. Qigong practitioners are counseled to never go to extremes of effort, and to always practice in a way that feels pleasant, open and enjoyable. They are also encouraged to practice outdoors, in a way that fosters a profound sense of connection to nature and the greater world around us. Doesn't that sound enticing? Although yoga is still my native language, I have been deeply enriched and enlivened by my exploration of qigong. I am in love with its vision of the inner workings of both the body and the universe, with energetic mappings that feel authentic and true. I love the language of qigong, which tells us we have "bubbling springs" and "fields of elixir" and "golden palaces" and more within us. I love the emphasis on our connection with the natural world. And I love how soothing and sweet it feels in body, mind and spirit. My children tell me that when I practice qigong, I always have a smile on my face. Here's another beauty called The Teacup, which offers taste of how lovely (and fun!) the practice can be. I've also enjoyed the clear and inspiring instruction offered by acupuncturist and qigong instructor Jeff Chand at his website qigongforvitality.com. Jeff offers a huge range of guided qigong practices that are accessible, enjoyable and enlivening. I pracitce at least one of his routines almost every day. For a taste, try this lovely practice for stress, anxiety and energy. And if you suffer from insomnia, try this lovely qigong routine for deep and peaceful sleep. If you're interested in diving a little deeper, I recommend the offerings of Ken Cohen, author of The Way of Qigong: The Art and Science of Chinese Energy Healing. Cohen also has created several excellent video and audio programs through SoundsTrue. 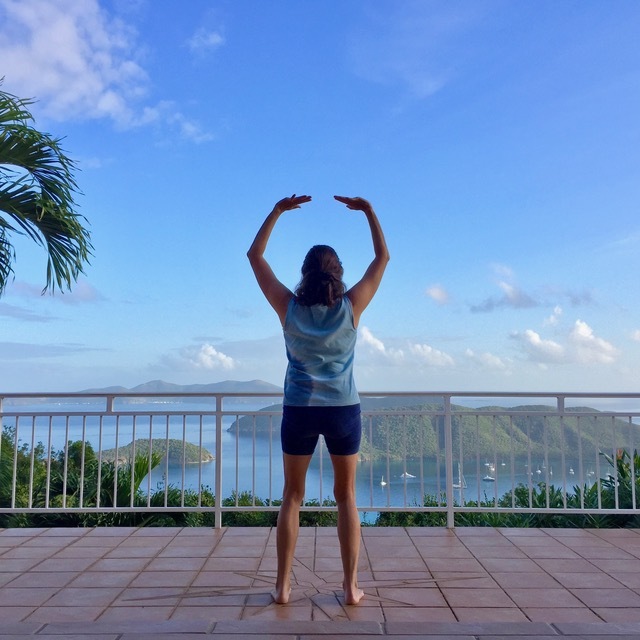 Have I inspired you to give qigong a try? I hope so. I hope you will find your exploration as nourishing and inspiring as I have. And I hope you fall in love with the practice even if - like me - you never plan to give up your yoga mat.